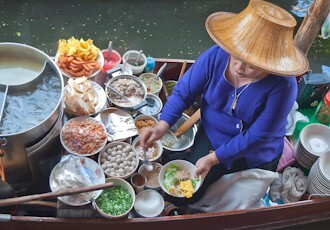 There are certainly Thai, French and Chinese influences, but true Cambodian cuisine is relatively unknown to the world. Lemon grass, fish sauce, soy sauce, curry, tamarind, ginger, coconut milk and oyster sauce all play a role in developing the layers of flavor that await your tastebuds. Kampot crab is a favorite for many visitors to Cambodia, but you absolutely must try the Nyoum Travong Chek – a salad made with chicken, banana flowers, Thai basil and peanuts. Whether you are learning new cooking skills, or dining on something exotic, the Cambodian cuisine is certain to be one of the highlights of your visit. Fill in the form below and we'll send you an email with all our current deals for Cambodia. Culinary & Cultural Excursion to Siem Reap Famous Angkor Wat, Bayon, Ta Prohm and More! Buddhists celebrate Meak Bochea by joining candlelit processions within temples in their vicinity. The Cambodian people to enjoy some time away from work to honour their leader. A religious ceremony marking the beginning of the rice-planting season in Cambodia. a day to appreciate children and the contributions they make to the family and to society & to bring attention to the plight of children in Cambodia.